Today's ceremony from friends, family and City Hall funded Bike/Walk KC. 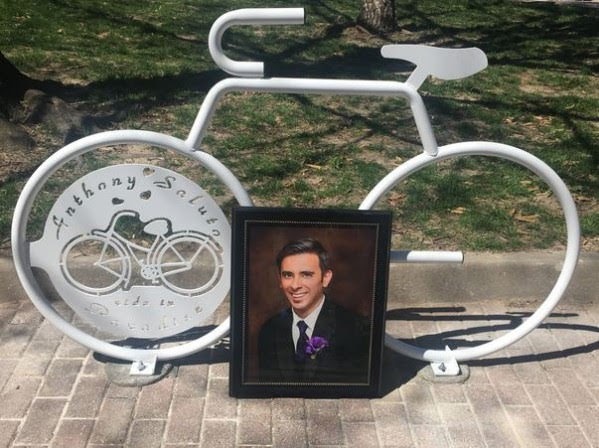 . .
On Sunday, April 3, 2016, 32-year-old Anthony Saluto was riding his bike on Independence Avenue when a car heading the opposite direction veered across the yellow line, striking and killing Anthony. The driver of the car was sentenced to four months incarceration and five years probation, despite appeals for a harsher sentence from Anthony’s family and BikeWalkKC. BikeWalkKC worked with the Saluto family, Lorrie Brown, and the KC Realty Group staff at City Market to identify the ideal location and work through the necessary permitting to ensure the rack will not be disturbed once it is installed. "...to ensure the rack will not be disturbed once it is installed." Whaaaat?! So, this is a vibrant and frosty city having marvelous momentum. There shouldn't be any worry about a painted steel memorial. It's not going to have to dive for safety into the bushes, is it? No one ever names the judge. If you are upset about a light sentence, name the judge. 10:02 The previous bike memorial was stolen. Hey Walk and Bike.....I want every driver on the road to have a memorial called the right to drive on a road that they pay for and keep your free loading bicycles off of those memorials. Quit desecrating our memorials. Go ride your bike on MLK Blvd all you want. Starting May 1 there will be a vehicle buy back program started.